The Superstars and staff stand on the stage for a moment of silence for the victims of the terrorist attack in Orlando. New Day heads to the ring. Kofi starts talking about New Day’s match at Money in the Bank, but Big E and Woods get distracted by Kofi’s old man shoes. Enzo and Cass then come out and talk about taking the titles from New Day. Cass is also distracted by Kofi’s shoes. He then talks about Enzo spending the night with Francesca II. As a verbal joust of wits is about to start, The Vaudevillains interrupt. Fun match. There was a lot of stuff happening and it didn’t always feel like a completely cohesive match, but it was fun and had a nice breakdown towards the end. Clips of The Shield’s debut at Survivor Series. Backlund wants to know how Darren Young will celebrate when he’s great again. He does the “Millions of Dollars” dance, but Backlund wants him to save his money. Shane tells Stephanie to take Smackdown, he’ll take RAW. She doesn’t like it so he wants to switch, but she wants both. Kane (in a suit) shows up and wants to run Smackdown. Zack Ryder talks to some people about Apollo Crews attacking Sheamus from behind. Sheamus walks up and gets in Ryder’s face. Clips of The Shield attacking Triple H.
The Shining Stars talk about the beaches of Puerto Rico. Titus O’Neil comes out for a match, but Rusev attacks him on the ramp. He runs Titus into the side of the stage and ramp, then kicks him in the back of the head. He finishes by putting Titus in the Accolade. Clips of The Shield’s breakup. 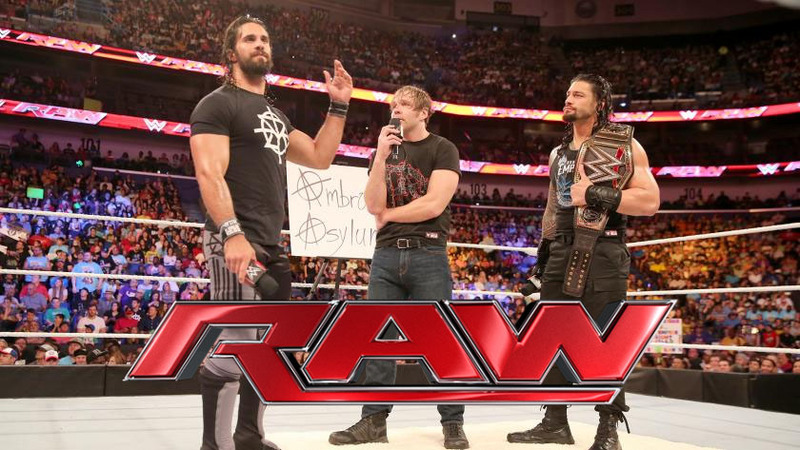 Dean Ambrose welcomes his guests, Seth Rollins and Roman Reigns. Ambrose asks Rollins how his knee is, then he makes a joke. He asks Reigns how he likes New Orleans. Ambrose tries to get Rollins to lighten up. Rollins recounts some of the good times they’ve had. The best time he had was when he took a chair to Reigns and Ambrose. Rollins tells Reigns that he earned the title, but he never beat him. If Rollins had never been hurt Reigns would’ve never won it. Rollins has done everything on his own, but Reigns needed help. Reigns says Rollins is right, that he broke up The Shield on his own. Ambrose gets the final word by saying he might win Money in the Bank and cash in. Rollins then starts a brawl. Stephanie informs Dean Ambrose that he will have a match tonight against Jericho. Ambrose wonders if Stephanie’s hatred is a virus. An okay match. It was really short and the commentary was distracting, but the action was fine. Not great, but fine. Renee Young asks Cesaro about facing Sami Zayn tonight, but Zayn interrupts. Cesaro tells Zayn that he’s acting like a child. Zayn thinks they’re equals, but Cesaro says he still has a lot to prove. Charlotte is upset with Dana. She calls Dana a failure, but there’s no room for failure at the top. A short, okay match. It was really just an excuse to have Sheamus beat someone up. Sheamus continues to beat up Ryder after the match, but Apollo Crews runs out and attacks Sheamus. Clips from the history of the Money in the Bank match when Kane won and cashed in on the same night. Kevin Owens goes to Shane (and Kane) to tell him that Alberto Del Rio just arrived to the building. He thinks Del Rio should be taken out of the Money in the Bank match as punishment. Del Rio shows up and blames Owens for having airport security detain him for hours. Kane thinks they need a team building exercise, so he makes a tag match for them. Shane likes it. Good match. It was fast-paced which seemed to allow them to cram an awful lot into a fairly short amount of time. It made it very exciting, and it felt like it was an important moment for these two guys. The contract signing for the Cena vs Styles match. Cena comes out and talks about the reasons why he respects AJ Styles. He talks about how long it took for the WWE to finally give AJ a chance and says their match will be historic. Styles heads to the ring. Cena presents him with two contract options: one singles match, and one singles match with The Club at ringside. AJ talks about what if, but Cena shuts him up. AJ signs the contract without The Club. Pretty good match. It was all about Owens and Del Rio arguing, but it was a fine match. Via Facebook, The Miz delivers a message from the set of The Marine 5: Battleground. Kevin Owens complains to Stephanie about his crap night. He tells Steph that Sami is on commentary for the next match, so he wants to be on commentary too. Del Rio also wants to be involved, so Steph makes him the guest timekeeper. Shane accuses Stephanie of being on a power trip. They end up talking about Kane. They tell Kane that they need more stability on SmackDown than what he can provide. Good match. All of the guys at ringside weren’t too distracting and Jericho and Ambrose were actually able to have a decent match. After the match all of the Money in the Bank match competitors brawl. Jericho takes a ladder into the ring and pulls down the hanging briefcase. There seemed to be a lot of filler on this show. There wasn’t a ton of wrestling either. There were good moments here relating to the bigger matches upcoming at Money in the Bank (during the Ambrose Asylum, the contract signing, and most of the MitB stuff), but then there were also extended segments with not a lot going on. This match seemed kind of quick, but these guys worked hard to make an important feeling match happen in that time. This was the most exciting bout of the night.